The 300 Remington SA Ultra Mag is also widely known as the 300 Remington Short Action Ultra Magnum round. 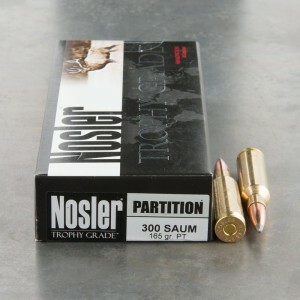 This round is a shortened version of the popular 300 Ultra Mag. The 300 Remington SA Ultra Mag’s main difference from the standard 300 Ultra Magnum is the fact it can be used in short action rifles. The 30 caliber projectile allows the round to be incredibly versatile, and can vary greatly between projectile weight. Common factory loadings are 150, 165, 180, and 200-grain. Although the heavier rounds offer greater penetration and energy transference, they do sacrifice velocity, and often feature heavier recoil. In terms of lost velocity a 150 grain round can reach up to 3,253 feet per second, but when loading with a 200 grain round the velocity results in a 2,790 feet per second.